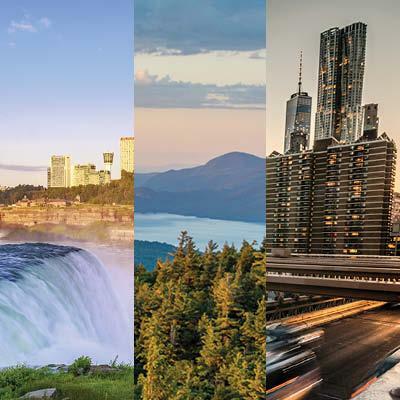 Explore New York State Destinations: Vacation In Niagara Falls, The Adirondacks, Catskills, Finger Lakes Region, Capital Region, New York City & More! Fall in love with the landscape, the mountains, the lakes -- the quiet hamlets and farm lands and the busy cities and towering skyscrapers. Enjoy the vast activities and historical sites New York has to offer throughout all four seasons, from spring fishing to summer sailing to fall hiking to winter skiing. The Adirondack Region, covering a six million acre park, offers a relaxing get-a-way among the Adirondack Mountains - home to New York's highest peak, Mount Marcy. Vacationers are able to enjoy the wilderness in high style at 5-star resorts, or in sleeping bags rolled out under the stars. Hike up lush mountainsides, kayak the rapids, or simply relax by a campfire. Dine at elegant gourmet restaurants or enjoy brook trout roasted over the grill. No matter what style of Adirondack vacation you prefer, you will enjoy experience spectacular vistas all four seasons of the year. There is something for everyone in New York State, from the adventurous to the tranquil. If the fast pace life is something that sparks your interest, discover the Big Apple! Fly into the renown JFK or LaGuardia Airports, travel by train along the majestic Hudson river while enjoying the lush scenic route, or drive into the City by accessing the various famous bridges. We guarantee that your stay in New York City will be memorable. The area offers a plethora of activities for the entire family. Winter is a favorite season for both the beginner and advanced level skier and snowboarder. With hundreds of New York State ski resorts to choose from, you'll have a hard time choosing where to go. Summer Water activities such as boating, water skiing and swimming can be enjoyed not only in the pristine Finger Lakes region, but also in the Adirondacks, the Thousand Islands Region and Lake Erie.